. 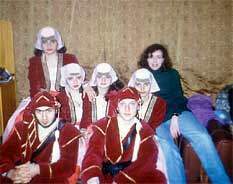 :Greeks of Pyatigorsk:. - . :The present day:. The photo that was found in the family archives of the local Greek Miltiades Efstathiades sets the example for today's Greek Community and shows us that we should aim at the promotion and cultivation of a civilization which existed in Greeks of Pyatigorsk and to enrich him with the one of the Metropolis, which has gone far ahead, furthermore to preserve and continue the civilization of the Greeks of Pyatigorsk. The culture - no doubt - and the soul, but basically the first keeps us a live as Greeks during the centuries for away from Greece. Since 1998 she has been studying as a post-graduate student at the Russian Music Academy in Moscow. Distinctions: award-winner at the international competition of pianists in Italy, participated in the international art festival in Greece. Dimitry Petanov (father’s name Elias) was born in 1980 in the city of Pyatigorsk, both parents are Greek. In 1995 he finished school and the Safonov Odeon, piano and clarinet department. The same year he entered the Gnesinyh music school in Moscow and graduated from the piano department in 1999. 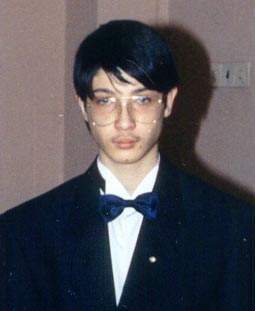 Since 1999 he is a student of the Gnesinyh Russian Music Academy in Moscow. 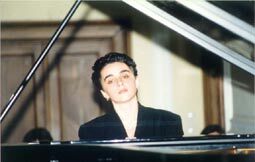 Petanov was a prize-winner in the Russian competition of pianists which took place in Pyatigorsk in 1993 and in Moscow in 1994 and 1996. In 1999 he was also awarded a prize at the international competition of pianists in Athens. Christos Polandov (father’s name Dimitris) was born in a village called Grecheskoye (Greek), Min-Vody region, district of Stavropol. From 1950 till 1968 he used to work as a teacher of painting and graphic art at the school of intermediate education, later on, in 1990 he started working at the painting exhibition department of the Stavropol district. He graduated from the State University of Kuban, painting and graphic arts department. He participated in exhibitions presented in cities, peripheries and districts. In 1998 he organized his personal exhibition in Thessaloniki, Greece. Dimitris Polandov (father’s name Christos) was born in 1965 in the city of Min-Vody. He finished the school of fine arts in Stavropol with the highest mark. He participated in the local exhibitions but he also organized his own ones. 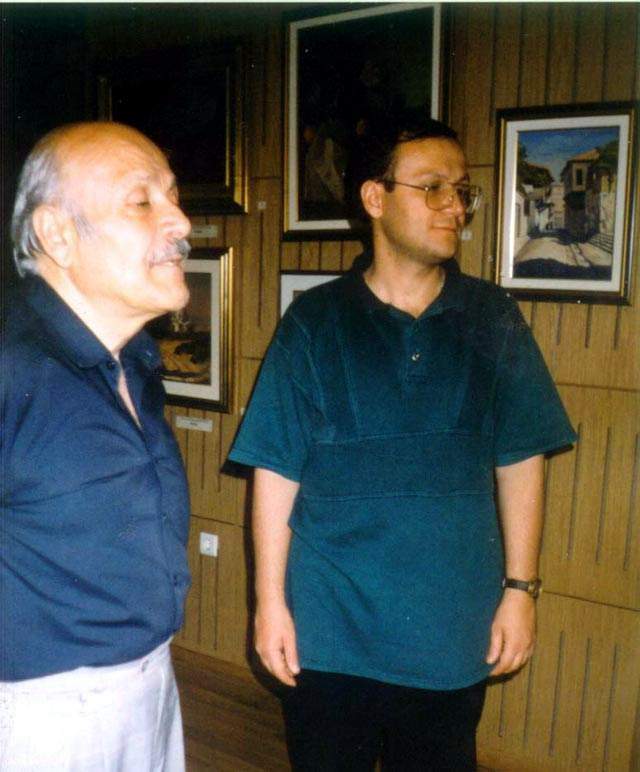 He took part in the international exhibition of artists from the Soviet Union in Greece. He presented his work in Thessaloniki. At the moment he is preparing his personal exhibition in Germany. One of the major objectives written in the articles is the continuation of the Greek civilization. 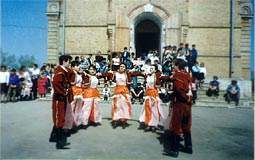 When the community was established, the most well preserved part of the rich culture were the Pontian Dances that would generally be presented at the Greek weddings. 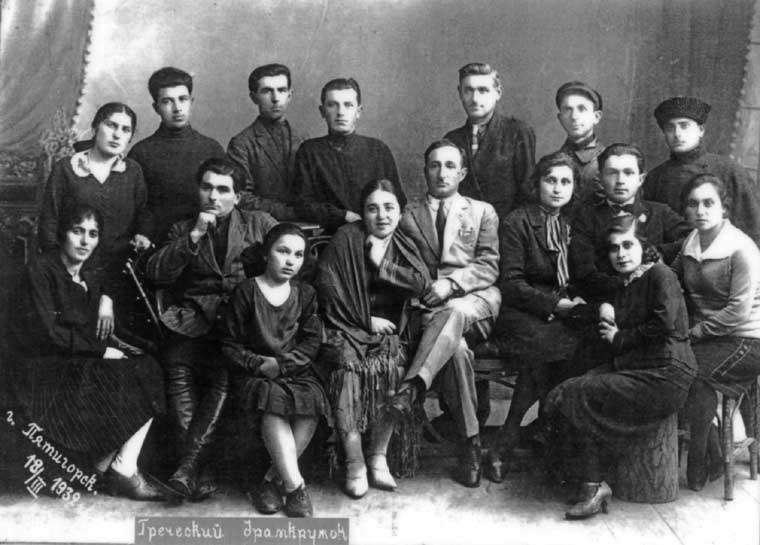 For this reason, at the first committee congress of the reborn community, a decision was taken for the formation of a Pontian Dances ensemble. In the photo: “From the celebration for the 100 years in Grecheskoye village just outside Pyatigorsk”. The aim was the preservation and cultivation of the Pontian dancing culture. 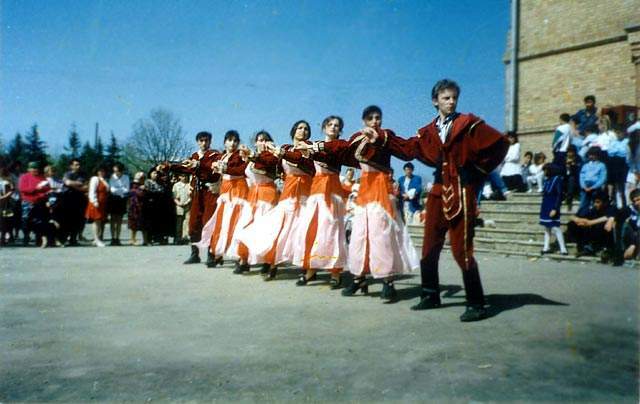 By participating at several festivals, the dancers who perform in casual outfit introduce and popularize the Greek dances to the Greeks of Pyatigorsk. In the photo: “Residents and visitors of our city get familiar with the Greek dances during the celebration for the 220 years of Pyatigorsk”. Today we are in the position to say that we have accomplished the targets we had set at first. 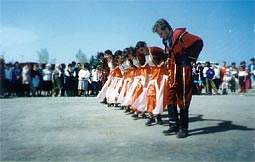 Certainly there is no single Greek nowadays who participates at the national celebrations and is not able to perform traditional Pontian Dances. In the photo: “A minute of rest with the choreographer Marina Borzilova”. After the participation of our choreographer (Marina Borzilova) at the educational program for choreographers which was organized by the General Secretariat for Greeks Abroad in 1999, at Kalamata (Greece), the ensemble's repertoire was enriched by traditional dances from Ipirus and the islands. In the photo: “From the celebration for the 100 years in Grecheskoye village outside “Saint George” church. In the ten years of its existence the ensemble improved its staff many times. 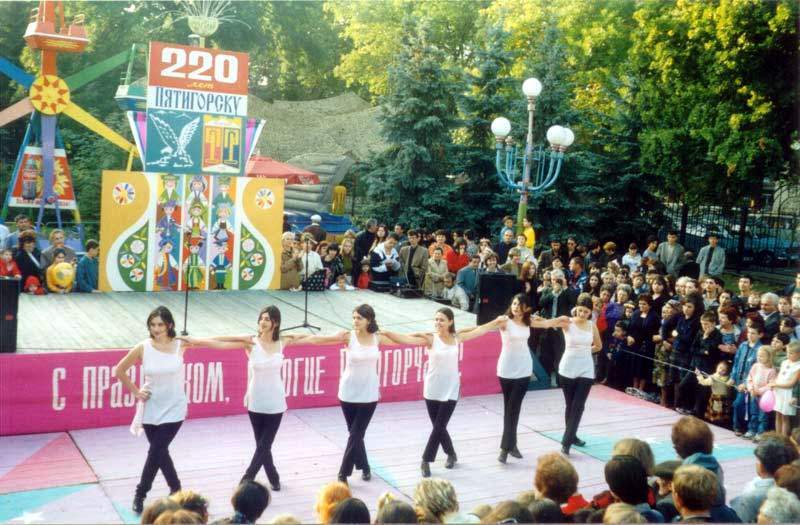 In 1998 the ensemble "Stefania" took part in the starting ceremony of the World Youth Olympics in Moscow. 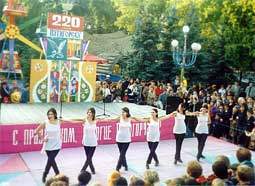 Many times "Stefania" took part in several cultural activities organized in Pyatigorsk and other areas of Russia. The photo: "From the celebration for the 100 years in Grecheskoye village just outside Pyatigorsk". We should also mention the problems the ensemble faces. The community hasn’t got a ball room for rehearsals, a dancing uniforms wardrobe, a storage for musical instruments and sound equipment. We are shure that this problem will be solved soon with the help of the Greek businessmen of Pyatigorsk. It would be better to work together with the Greek side on the teaching of our musicians and choreographers and we strongly believe this is only a matter of time.